Harry Olson graduated from Whitworth University in 1918 and was enlisted into the Army's 161st Infantry Division. Olson, was a good and kind-hearted man; he once said, "With malice toward none; with charity for all." Olson had a deep family bond and cared for those around him, he was never afraid to put his faith in God. After the war, his parents kept the letters exchanged between them; they treasured these letters to remember their 22 year old, loving and optimistic son who died for his country in WWI. A man of many talents and trades. 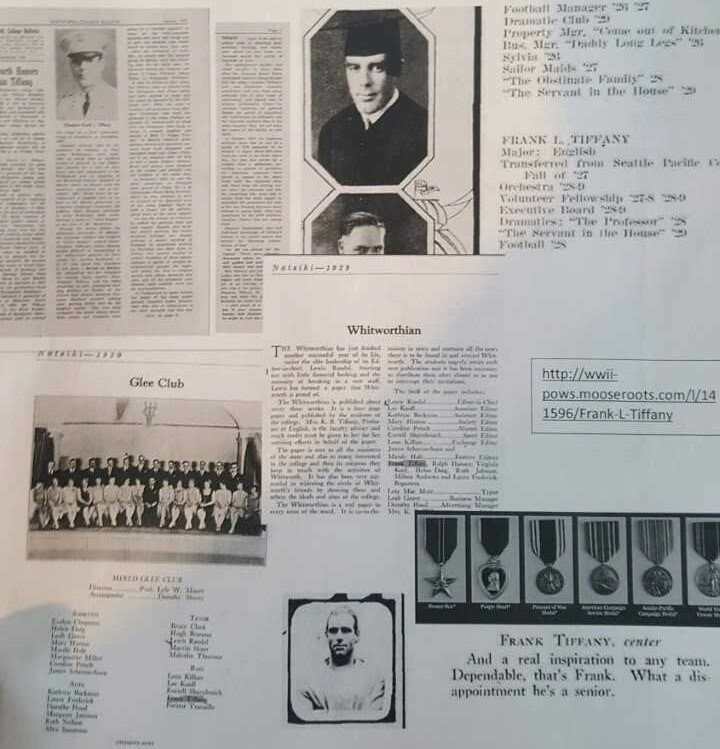 At Whitworth, Tiffany served as an editor for the Whitworthian, a member of the Glee Club, football player, a part of the orchestra, a member of the executive board, an English major, and Sunday school teacher; he graduated in 1924. As chaplain of the military, he was a savior to many. Tiffany counseled and ministered to thousands of Americans and Philippines in the Japanese prison camps of WWII. He served in Bataan and built an underground organization to get many needed supplies for his fellow prisoners. When the Japanese Secret Police found out, he was tortured and added to the list of prisoners to be sent to Japan. The ship was torpedoed on the way and sank. 9 out of 1770 prisoners survived, Frank Tiffany was not one of them. Tiffany lives on through his wife and daughter who lived and live in Cheney, WA. Tom Haji was a Japanese-American who was loved by many friends and was involved with many things at Whitworth. He majored in pre-engineering at Whitworth College. After Pearl Harbor, Haji was debating on if he should go to school or not. His ethnicity has never haltered him before this moment. His friends eagerly coaxed him into coming back to school. He was expected to graduate in 1947. Later that year, Haji and his family were forced into an American Japanese camp in Idaho. It was here that he joined the army as part of the 442nd. Haji was part of the Italian Campaign and the spring 1945 offensive in Italy. His Japanese ethnicity did not stop him from becoming an American hero, he died in the offensive at 20 years old. Forrest Ewens was one of the few kinds of people that his smile would seemingly light up the room. He had courage and faced things head on with unwavering determination, the good and the ugly. At Whitworth he was a loved to many, an athlete and a History major. Fellow Whitworthians praised him for his leadership and unwavering determination as the Track team's captain. Ewens was in Afghanistan during Operation Enduring Freedom when an Improved Explosive Device (IED) hit his truck. The blow was a fatal one to Ewens and one other comrade. Forrest died at 25 years old, he lives through his loving wife and identical twin, Oaken Ewens. Ralph Goodsell attended Whitworth from 1939-1943. He was well-known among students and involved with the Whitworthian and with school plays. Ralph Goodsell participated in the Whitworth Players, which were a small group of actors. During his time working with the Whitworthian, he worked as a reporter. The next year , Goodsell worked as the VP of the French club. After that, he served as an ASWC (Associated Students of Whitworth College) social committee member and as an assistant Business manager for Natsihi. Ralph Goodsell served in the Army Air Corps. In-route from Colorado Springs to Reno, eleven airmen, including himself died when they struck a mountain about 36 miles west of Austin, Nevada. Paul Okert served in the Army; he was a part of the 21st Armored Infantry Battalion which was within the 11th Armored Division. One of the significant places that they served was the Battle of the Bulge, and which was when Paul Okert died on January 14, 1925. The Battle of the Bulge was one of the biggest turning points for the Allied invasion of Nazi Germany. US troops dug into the Ardennes forest that covers Belgium and Luxembourg, held off the largest Nazi counterattack and opened the way to Germany. The long battle started on December 16, 1944 and lasted until January 25, 1945. 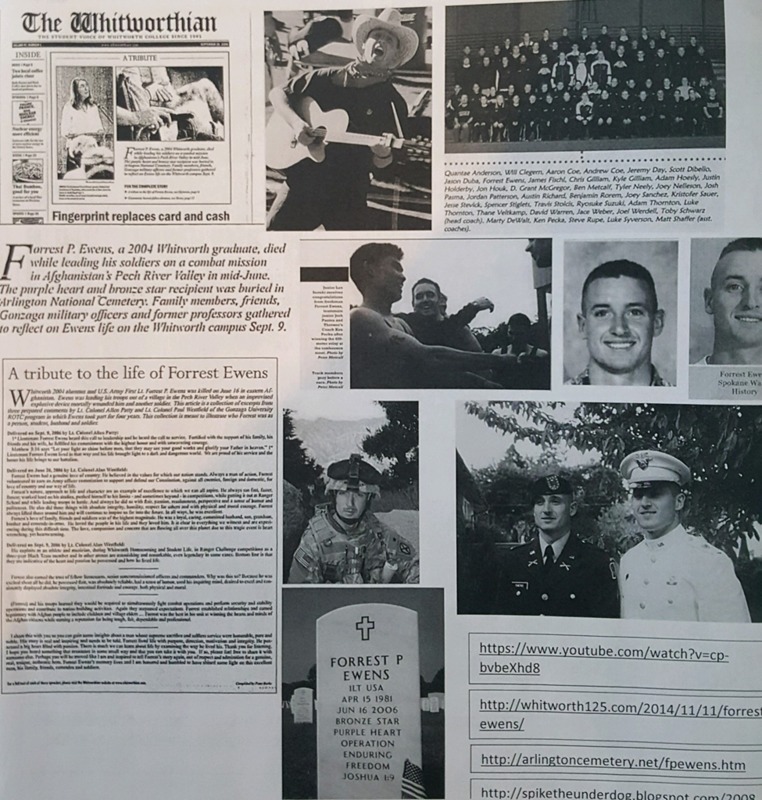 Keaton Oberlander, “Whitworth Veteran Memorial: In Memory of Those who Died Protecting the U.S.,” Spokane Historical, accessed April 19, 2019, https://spokanehistorical.org/items/show/801. Whitworth University, "The Whitworthian Senior Edition 1916" Whitworth University (1916). The Whitworthian Student Newspaper. Paper 59. http://digitalcommons.whitworth.edu/whitworthian/59 Harry Olson, Spokane County WWI Soldiers Miscellaneous Lists, Washington State Archives, Digital Archives, http://digitalarchives.wa.gov Whitworth University, "Natsihi Yearbook 1918" Whitworth University (1918). Natsihi Yearbook. Paper 1. http://digitalcommons.whitworth.edu/yearbooks/1. Whitworth University, "Natsihi Yearbook 1944" Whitworth University (1944). Natsihi Yearbook. Paper 19. http://digitalcommons.whitworth.edu/yearbooks/19. Vega, Mario. "Undergraduate History Major, awarded Summer Mini-Grant." History. 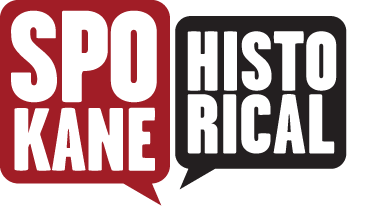 https://history.wsu.edu/author/pguptill/page/2/. "Italian Campaign (World War II)." Wikipedia. November 04, 2017. Accessed November 12, 2017. https://en.wikipedia.org/wiki/Italian_Campaign_(World_War_2) "Spring 1945 offensive in Italy." Wikipedia. November 01, 2017. Accessed November 12, 2017. https://en.wikipedia.org/wiki/Spring_1945_offensive_in_Italy. Keary, Polly. "NVC Newsletter." Tom Haji: Not Forgotten Part 1. Accessed November 12, 2017. https://www.nvcfoundation.org/newsletter/2009/4/tom-haji-not-forgotten- part-1/. Whitworth University, "The Whitworthian 1944-1945" Whitworth University (1945). The Whitworthian Student Newspaper. Page 37. http://digitalcommons.whitworth.edu/whitworthian/37. 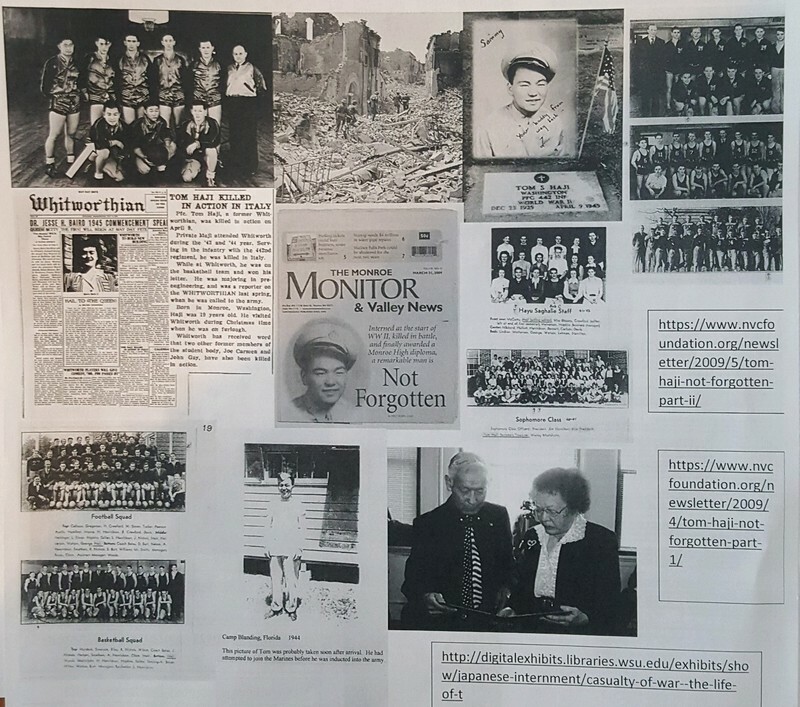 "Death of Tom Haji and Memorial," Digital Exhibits, accessed November 16, 2017. http://digitalexhibits.libraries.wsu.edu/items/show/8084. "Tom Haji Before the War," Digital Exhibits, accessed November 16, 2017. http://digitalexhibits.libraries.wsu.edu/items/show/8085. "Tom Haji Joins the War Effort," Digital Exhibits, accessed November 16, 2017. http://digitalexhibits.libraries.wsu.edu/items/show/8086. Keary, Polly. "NVC Newsletter." Tom Haji: Not Forgotten Part ii. Accessed November 12, 2017. https://www.nvcfoundation.org/newsletter/2009/4/tom-haji-not-forgotten- part-1/. "Going for Broke: The Life and Death of Tom Haji." Japanese American Internment During World War Two. http://digitalexhibits.libraries.wsu.edu/exhibits/show/japanese-	interment/casualty-of-war-the-life-of-t. Whitworth University, "The Whitworthian 2006-2007" Whitworth University (2007). The Whitworthian Student Newspaper. Page 94. http://digitalcommons.whitworth.edu/whitworth/94 Whitworth University, "The Whitworthian 2002" Whitworth University (2002). The Whitworthian Student Newspaper. Page 80. http://digitalcommons.whitworth.edu/whitworthian/80. Whitworth University, "The Whitworthian 2001" Whitworth University (2001). The Whitworthian Student Newspaper. Page 81. http://digitalcommons.whitworth.edu/whitworthian/81. Whitworth University, "The Whitworthian 2003" Whitworth University (2003). The Whitworthian Student Newspaper. Page 82. http://digitalcommons.whitworth.edu/whitworthian/82. Cole, Matt. "We still remember." The Underdogblog. 2008 http://spiketheunderdog.blogspot.com/2008_05_18_archive.html Public Affairs, Army. "Whitworth lowers flag in honor of fallen graduate." Arlington National Cemetery Website. 2006. http://arlingtoncemetary.mil/fpewens.htm Whitworth University. "Forrest Ewens." The Campaign for Whitworth. November 11, 2014. Accessed November 12, 2017. http://whitworth125.com/2014/11/11/forrest-ewens/. 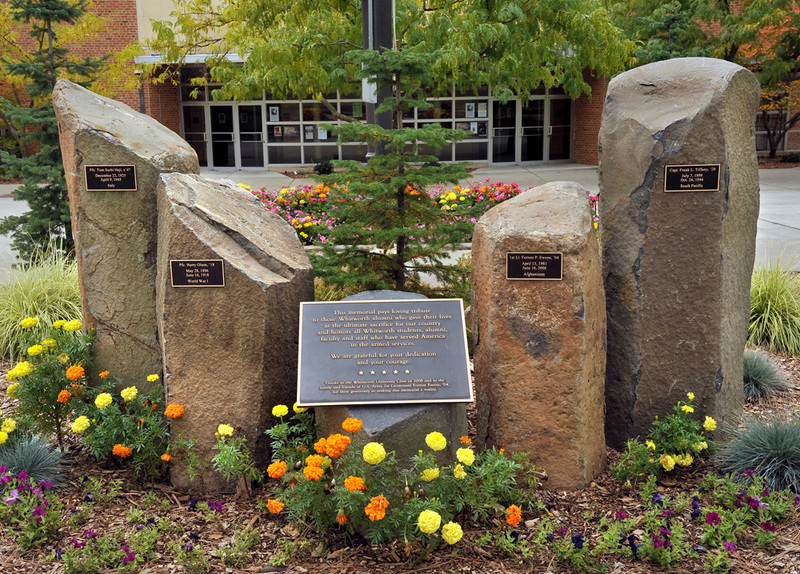 Whitworth honors alumni killed in Afghanistan. Directed by KXLY. Performed by Dale Soden. YouTube. https://www.youtube.com/watch?v=cp-bvbeXhd8 Whitworth University, "Alumni Magazine January 1947" Whitworth University (1947). Whitworth Alumni Magazine. Paper 156. http://digitalcommons.whitworth.edu/alumnimagazine/156. Whitworth University, "Natsihi Yearbook 1929" Whitworth University (1929). Natsihi Yearbook. Paper 5. http://digitalcommons.whitworth.edu/yearbooks/5. "WWII POWs." Moose Roots, Frank L. Tiffany. http://wwii-pows-mooseroots.com/l/141596/Frank-L-Tiffany. "Frank L. Tiffany Captain, U.S. Army." With Military Honors. http://www.withmilitaryhonors.com/wwii/id/pow/TiffF6297.php.